Equipment > PrecisionCounter_500 | Arrow Games/Bazaar & Novelty - Helping you accomplish great things! The PrecisionCounter™ 500 is engineered with the same proven reliability and quality you have come to recognize across the entire Arrow line of products. 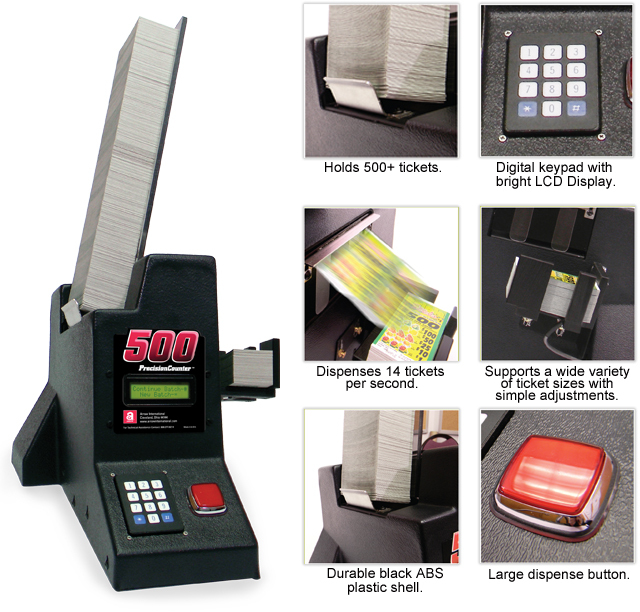 The PrecisionCounter™ 500 is easy to use and program. Simply fill the open column with pull tabs, enter the desired batch amount and timing interval, press the large red button, and you’re ready to sell. Click to watch the PrecisionCounter™ 500 video. Save time - sell more! Supports a wide variety of ticket sizes with simple adjustments.